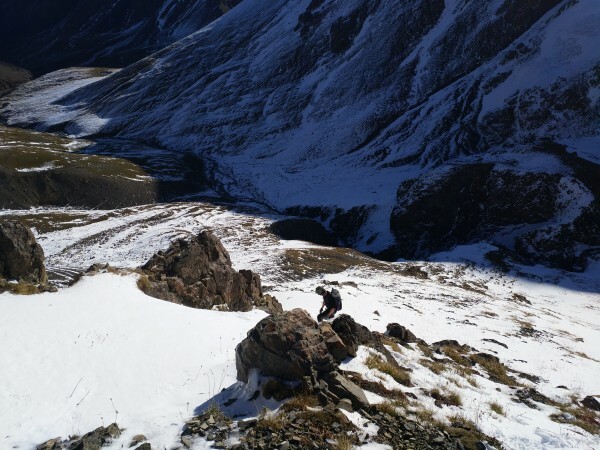 Sauyr Zhotasy 2018, the North Buttress route. Almost. 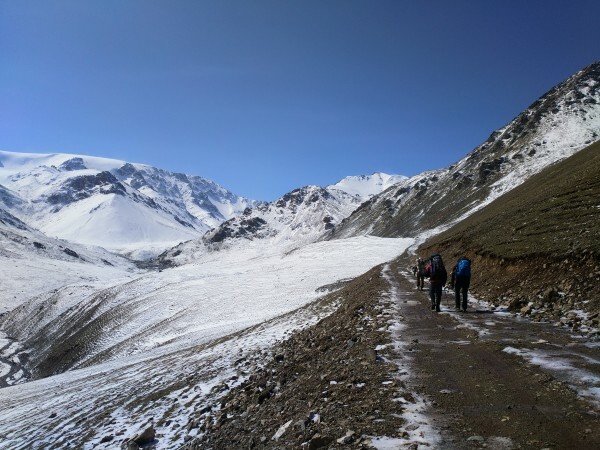 After 2017s attempt, knowing what we now knew, Eric Kowalski, Alex Tang and Ed Hannam returned to the China/Kazakh border for another attempt on Sauyr Zhotasy, this time accompanied by Libor Jelenek and Wayne Stanley. After the security hassles of last years southern approach we opted for the much longer but much less observed North Eastern approach, along a valley well away from the border. Northern xinjiangs unexplored nature makes for considerably more unusual events than most destinations. 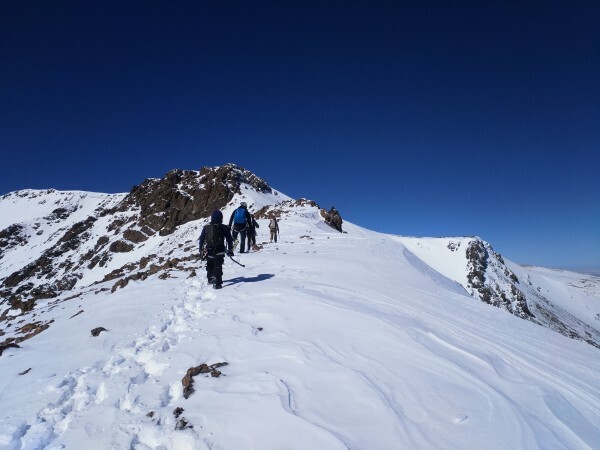 Firstly, we found out about the name; the actual peak is called Muz Tau, the Kazakh work for Ice Mountain. The Tuvans to the south don’t have a name for it, the Chinese also use Muz tau. 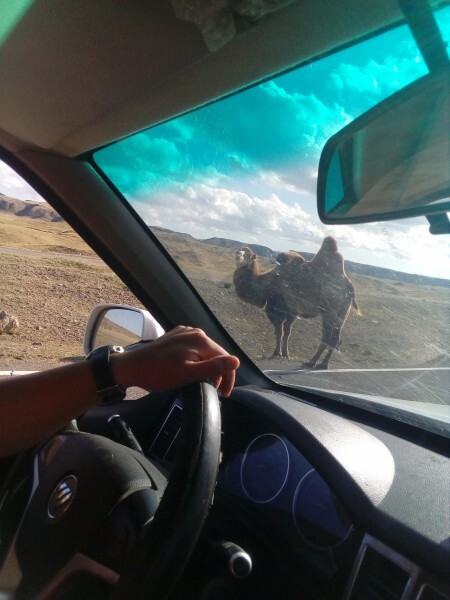 The name Sauyr Zhotasy bemused locals as a disjointed amalgamation of Sauyr which is the old name for the now Jeminay area, which includes the name of the range, and (z)hotasy which is an unremarkable town on the northern side. No one we met recognized Sauyr Zhotasy as its name, including the Xinjiang Mountaineering Association representative. Muz Tau’s true summit is about 1km beyond the rocky outcrop left of center. Shot taken from atop the initial rise from the valley. Approached over 4 days, including time sitting out rain and snow, we arrived at the foot of the north ridge. 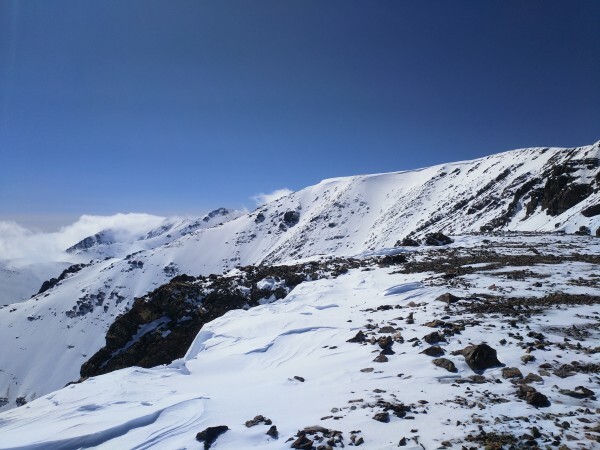 Much more dramatic than the south facing side, the north side retains snow year round and is several kms beyond the last established human camps – other than the military posts high over the ridge on the border. Temporary ger sites dot the flood plain, but otherwise theres not enough pasture to lure the Kazakh goat herders, most of whom are now collected into cookie cutter villages for much of the year. The 4 day approach took us from the lower herb, onion, rose and blueberry choked gorges gradually into the upper scree valleys beyond even the nomadic habitations. The final kms along a bulldozed border road kindly installed by Chinese security. Steep and exposed, the North buttress route has snow to about 60o and 2 pitches of easy mixed alpine thru the buttress. Rock quality was splintered and friable cracks. Ridges were beginning to cornice in early September and it wouldn’t be much longer till snow dangerously loaded the faces. It appeared wed hit a sweet spot right when the season turned and the first snows bonded well to the rock, further shrink wrapped on by the still-warm sun. 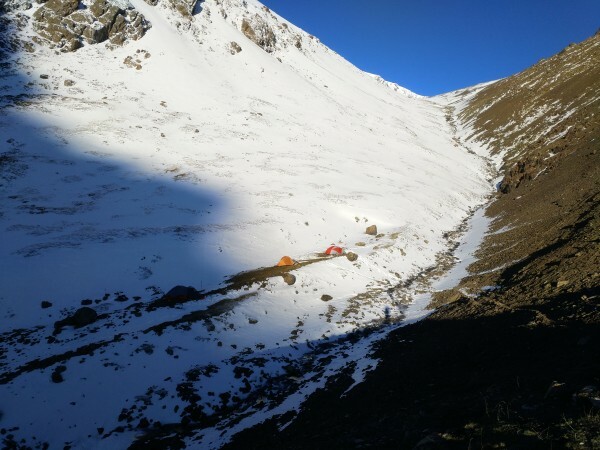 Basecamp at about 3000m along an icy stream that lead to the border. So long as the guards kept their eyes towards Kazakhstan wed go unnoticed. Bright orange tents were not the ideal choice. the skyline is effectively the Kazakh/China border. Much of the climbing was linking steep sections of snow along the shadow line of a fin of rock, exposed but safe. Beyond that a stepped up ridgeline lead to the buttress where we left 2 ropes fixed for the descent. Overall nothing too taxing, but the buzz of route finding thru completely undocumented terrain added an adventurous edge. Weaving together consolidated snow patches low on the initial slope. Of an 800ms / 6km ascent, 600m took place over the first 1km. Approaching the north buttress, the only committed climbing on the route. 2 pitches of easy but exposed mixed. The windswept upper ridgelines above the buttress and along the lip of the glacier, just starting to grow their winter cornices. Afternoon clouds began building to the south, a weather pattern wed not seen over the prior week. Unsure and unwilling to see if they would blanket the peak, we retreated about 100m below the summit at 3740m and about 1.5km away as it lies well beyond a series of false summits. With no useful weather records on the range and 4 days from the car, we kept a conservative margin after experiencing the afternoon deluges on the approach. Descent was a simple matter of retracing out steps, down thru the buttress. So the first official ascent still awaits. 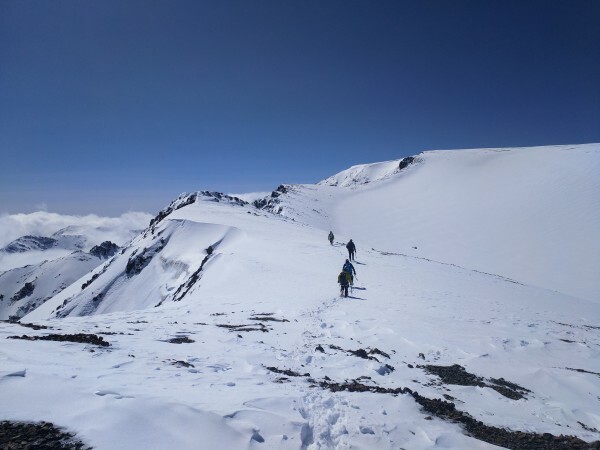 After seeing the approach from the low angle ice fields and ridges to the north its hard to see how its not been climbed – tho these approached are well off limits to anyone not with the Chinese border guards. That said there are far more stimulating routes than simply wandering up a glacier and the entire range has dozens of +/- 900m alpine faces, including beguiling glacial snouts, that would be good autumn climbing. 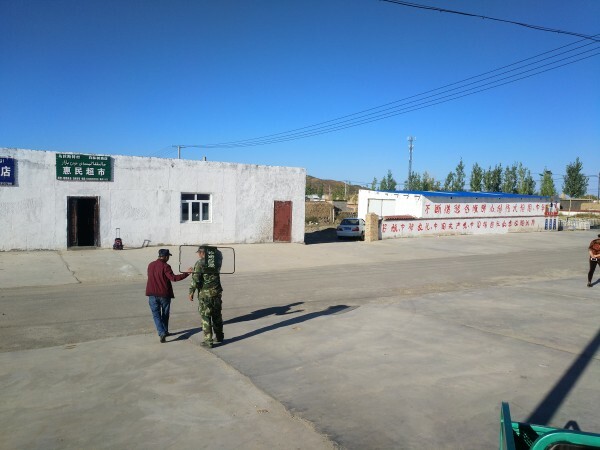 Even in the little remote villages they rolled out security, tho it seemed mostly it was middle aged volunteers more to deal with drunk herders than islamists. Perspex shields and axe handles were the fighting order. ecdh is a climber from the east. F*#king right! Thanks for a TR from a place with different rules. whats it that the kidz say?